Home Calibration & Repair F.A.Q. Are you ISO 9001 certified ? A laboratory’s fulfillment of the requirements of ISO/IEC 17025 means the laboratory meets both the technical competence requirements and the management system requirements that are necessary for it to consistently deliver technically valid results and calibrations. The management system requirements in ISO/IEC 17025 are written in language relevant to laboratory operations and meet the principles of ISO 9001 quality management systems requirements. Are you accreditated to ISO?IEC 17025? Are you N.I.S.T. Traceable ? We have proven traceability by our accreditation to ISO/IEC 17025 through the American Association of Laboratory Accreditation (A2LA). We provide traceability on all our calibration certificates to NIST or to other recognized national or international bodies, or derived by the ratio type of calibration, or accepted natural and physical constants. Do you come on-site ? NOTE: Not all Calibrations, such as high accuracy items, can be done on-site, as they require Lab conditions to Calibrate. Do you Pick-up and Deliver ? Yes, we provide local pick-up and delivery service. Do you calibrate in a controlled environment ? Yes, our laboratory has a controlled environment and our Lab Calibration Procedures ensure the integrity of this environment. Do you supply before and after data ? We always supply before and after data on our certificates of calibration. Are your calibration technician's properly trained ? We are ISO/IEC 17025 accredited so training is an important part of our quality program. We are continually training to assure we provide the highest level of quality possible. What is your procedure if a standard used for calibration is found out of tolerance ? A review of all calibrations performed using the out of tolerance standard is performed. 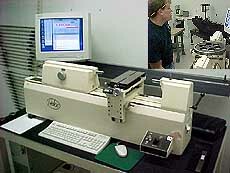 Customer gage/instrumentation that the out of tolerance condition may impact are contacted. HJM Precision Inc. will recalibrate the gage/instrumentation at no charge. Do you maintain a 4 to 1 ratio between standard and item to be calibrated ? Our goal is to maintain a 10 to 1 ratio. All calibration test points performed that do not maintain a 4 to 1 ratio are identified on the certificate of calibration. • The in house turnaround time runs from 5 to 7 business days. This may increase to 7 to 10 business days in peak periods. • We do offer a expedited service at additional cost. Is there a minimum charge ? Yes, we accept MasterCard, Visa, and American Express.